Answer: Normally, the higher up you go in the atmosphere, the cooler it gets. Rule of thumb: About 3.6° Fahrenheit cooler for every 1000 feet in altitude. There’s also a decrease in air density (weight per volume) with altitude. This is a very stable configuration — the atmosphere is in equilibrium. But you still get diffusion and random mixing of air between layers, which is good for clearing pollution. It’s what’s called the altitude profile for a “normal” atmosphere. But sometimes we get a layer of cooler air trapped under a layer of warmer air. This is what’s called an inversion, since the normal temperature profile is inverted. It’s also a very stable configuration. Cool, dense air is heavier than warm air, so it just sits there and doesn’t mix with the layers above. This allows smog, dust, ozone, carbon monoxide, and other nasty things to accumulate in that cool layer until the inversion dissipates. 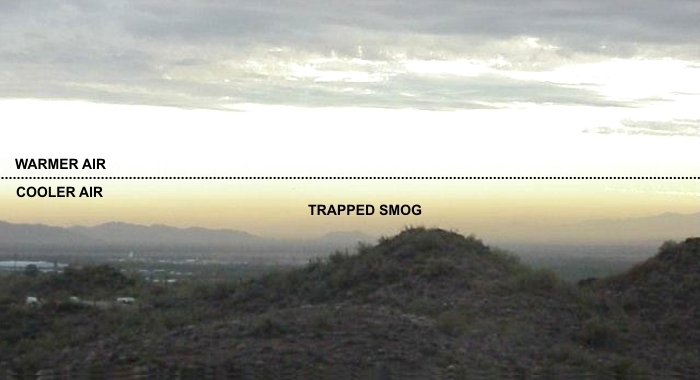 The image shows a particularly bad smog day for Phoenix. The tan-colored stuff is the smog (SM-oke + f-OG). Most of it comes from burning fossil fuels. Many of its noxious components are invisible. The air above is clear. The dotted line marks the top of the inverted layer. You can see why they advise people to limit outside activity, especially those with respiratory problems. This is also why “no burn” days are declared and enforced. All that fireplace smoke would just add to the pollutants in the inverted layer. “No burn” fines in Arizona range from $50 to $250. Inversions are usually caused by rapid cooling of surface air on clear nights. They’re exacerbated by low wind speeds, and geographical features like surrounding mountains that can help trap the inverted layer. Inversions last from days to weeks, depending on meteorological conditions. What finally breaks up an inversion is a change in those conditions. Higher wind speeds, precipitation, or the passage of a weather front can cause the inverted air layers to “turn over,” fully mix, and return to the normal altitude profile.